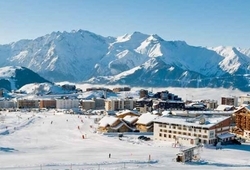 Positioned hign in the Grandes Rousses mountains, there are not many resorts that can rival Alpe d'Huez in terms of extent and variety of terrain. 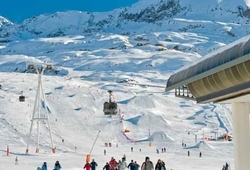 Nicknamed 'L'Ille au Soleil', or the Island in the sun, the resort proudly boasts the 5th largst ski area in France, liking the villages of Vaujany, Oz, Villard-Reculas and Auris-en-Oisans, which provide skiers with in excess of 200km of slopes to enjoy. 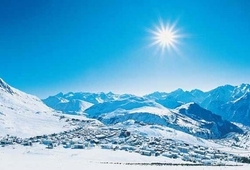 Alpe d'Huez has long with very popular with the French, due to its stunning scenery, large amount of sun where on average there are 360 days of sunshine a year and of course the extent of the skiing area. 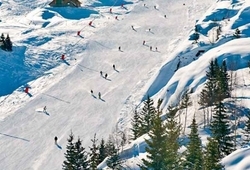 The resort is large and modern , located on a high, open and sunny plateuau, on the east side of Genoble, which is just 90 minutes away. The resort is spread down over a gentle slope, with the main village being split over 3 'quarters'. 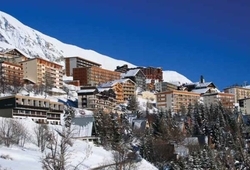 The resort does not only offer great skiing, but also a host of other acitvities, which include an excellent sports complex, a large indoor pool and skating rink, the latter two of which are free with full area lift passes. Apres Ski in the resort is action packed with the choice of many bars, lots of which have live entertainment, for those looking for something a little more relaxed there is a choice of more than 40 restaurants, catering for all tastes from pizzas to fondue, right through to those offering an a la carte menu. 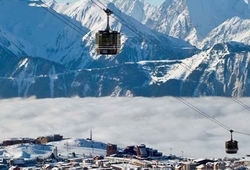 One of Alpe d'Huez's claim to fame is Jean Pomagalski invented the drag lift at the resort in 1936 and went onto the found the Poma Ski lift. His legacy continues with his son who now lives and skis in the resort. For those wanting to take a break from the skiing for a short while and soak up the sunshine, then there is no place better that the views at Le Signal, from where you can enjoy the wonderful surroundings at the Perce-Neige, on the way down to Oz.